What Are My Options After My DACA Status Expires? On September 5, 2017, the Department of Homeland Security issued a Memorandum rescinding Deferred Action for Childhood Arrivals (DACA). Per the terms set forth in the Memorandum, as of September 5, USCIS is no longer accepting initial applications for DACA. USCIS will continue to accept applications to renew DACA until October 5, 2017, but only for applicants whose current DACA approval will expire between the dates of September 5, 2017, and March 5, 2018. Assuming that Congress does not act to protect DACA recipients before then, recipients will start to lose benefits starting March 6, 2018. As DACA status expires, recipients will lose their ability to work legally and become vulnerable to potential enforcement action by Immigration and Customs Enforcement. The luckiest applicants are eligible to renew their DACA applications before October 5 and might continue to receive DACA benefits as late as September 2020. But all DACA recipients, whether they lose their status in 2018 or 2020, must ask themselves what options remain when their DACA benefits expire. If Congress acts, the landscape might look very different in 2018. It is possible that DACA will be revived, or that the Dream Act, providing a pathway to legal residence, will pass. It is also possible that Congress will fail to act, and that the options that exist in 2018 will be identical to the options that exist today. As a first step, all DACA recipients should be investigating their potential eligibility for a family-based green card. Recipients with a U.S. citizen parent, spouse, adult child or sibling are eligible for sponsorship, as are recipients with a green card holder spouse. In addition, unmarried recipients with a green card holder parent are also eligible. For recipients with a qualifying relative, the green card application process will vary based on how he or she entered the U.S. and the status and relationship of the family member who will be the sponsor. DACA recipients who “overstayed” a valid visa are fast-tracked in the green card process if they are sponsored by a U.S. citizen spouse, or adult child (over 21). If they’re unmarried and under 21, they can also be fast-tracked if they’re sponsored by a U.S. citizen parent. “Fast-tracking” can mean that an applicant receives his green card in as little as a year. DACA applicants who overstayed their visa can also apply for a green card through the sponsorship of a permanent resident spouse, although this process will take longer. An unmarried DACA recipient might also be eligible on the basis of a green card holder parent’s sponsorship and can expect to wait several years to finish the process. DACA applicants who are not eligible for fast-track processing face unique obstacles, in that they are not eligible for work authorization or protection from deportation while they wait for a “visa number” to become available to complete the green card process. For DACA recipients, who entered illegally (without a visa) the options are even more difficult. Although applicants can still be sponsored by a qualifying family member, they can’t actually apply for the green card unless they can prove to the government that returning to their home country would cause extreme hardship to a U.S. citizen spouse or parent. NOTE: There are many good reasons to move forward with the green card process by filing an I-130 process as soon as possible. Even if the DACA recipient is not eligible to apply for the green card without a waiver, it’s generally a good idea to establish that the applicant is eligible for sponsorship. Applicants who want to learn more about their eligibility for a green card should contact an experienced immigration attorney. Getting a green card through employment sponsorship sounds like a great option, but it presents a lot of challenges. 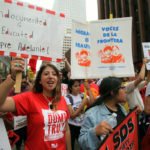 DACA recipients with employers who are willing to sponsor them should know that: (1) The process generally involves testing the labor market to identify any U.S. workers willing and able to do the job; and (2) The process can take years, with absolutely no protection (or authorization to work) while it is pending. Many DACA recipients have options beyond the green card path. U Visas, VAWA Petitions, and Asylum applications are all options worth exploring for DACA applicants who have been victims of persecution or violence. Finally, DACA recipients who have been in the U.S. for at least ten continuous years might be eligible for a form of relief known as “Cancellation of Removal” on the basis of exceptional and extremely unusual hardship to a U.S. Citizen or green card holder spouse, parent or child. The ball is in Congress’ court to pass legislation protecting DACA recipients after March 5. 2018. But applicants who are affected by the September 5 Memo should not sit back and wait for Congress to act. DACA recipients should be exploring all options to legally obtain status in the United States. DACA recipients who are eligible to start the green card process should do so as soon as possible. Those who are not eligible for a “fast track” green card, either because they entered the U.S. without a visa or because they are not being sponsored by a qualifying U.S. citizen family member, should at least start the process by filing an I-130 petition. In cases where the DACA recipient can’t get a fast-track green card or has no sponsor available, consider all available options by reaching out to a community-based organization or experienced immigration attorney who can discuss all available options.